I’d like to introduce our fearless leader and Editor of the upcoming Freeze Frame Anthology, Oscar Sparrow! This has been a wonderful project to work on and Oscar has made it so easy for all of us! Oscar’s own work is without peer, in fact, he’s my own favorite living bard! Here, an example from his delicious book of poetry, I THREW A STONE, available at Amazon.com, which has an audio file of him reading the poems accompanying it. as half an orchestra falls flat. beyond darkness triggers an enlightenment. I open the book and pray. For a little taste of his enormous talent, listen to him read what has been said to be the “worst poem in the world”, written by Theo Marzials. I found it enchanting! A TRAGEDY by Theo Marzials. Read by @Oscar_Sparrow Unforgettable! 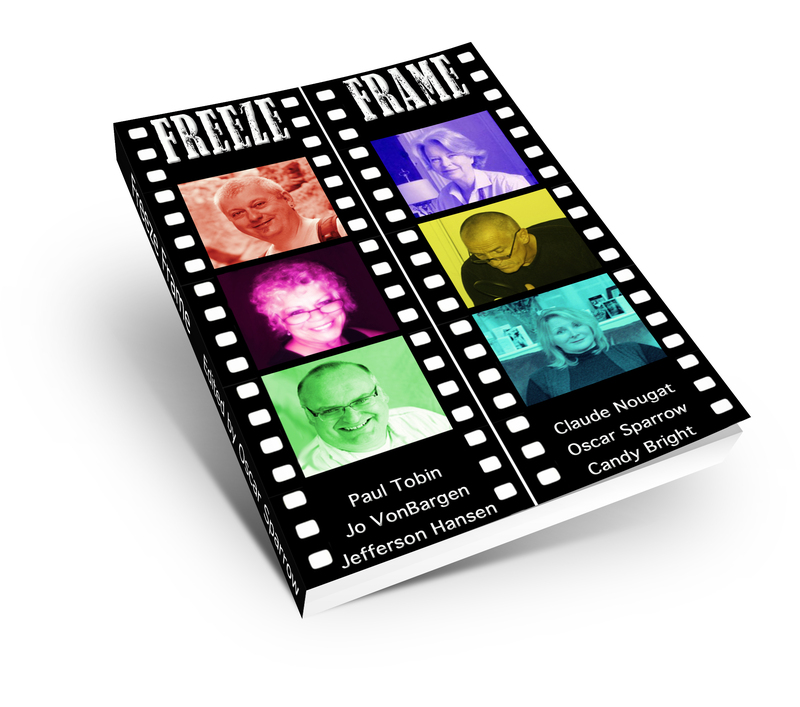 We are all so excited about FREEZE FRAME and offer heartfelt thanks to Oscar and his team atGallo-Romano for all the hard work they’ve done to come up with what we think is a fantastic result! I had the opportunity to interview Oscar before the release of the book, just as he interviewed us; this is a peek at the character of a very intriguing individual! Now that you’re wearing the Editor’s hat, has any of this become clearer to you? What has become clearer to me is that individuals are very capable of focusing on those moving moments of life. In some cases, moments of experience live on forever perhaps and to some extent define those individuals. It is even clearer to me that this IS the work of poetry in terms of how it stands relative to our minds in this multi-channelverse. As for Gaugin’s question – well, the linear idea of an individual life being a flash of light between bookends of oblivion is obviously far too simple. As for what we are, maybe more than ever I see that we are seekers of understanding. Probably we are trying to understand rainbows by eating mud. Poets deal with what they don’t know but they cook the mud before they serve it up. You are my favourite living poet, hands down. You peel a subject down to the quantum level, disassemble the atoms, then rearrange them into a veritable feast of multi-layered meaning and social commentary. I find them absolutely fascinating! When did you first realize poetry would take over your life and be your very breath? What a wonderful compliment – thank you. I suppose that as quite a young kid I did not fit in because I wanted conversation and discussion to go much further and deeper. We use descriptions such as “as hard as stone”. The use of words in this context troubled me and kids and teachers shuffled away when I would ask how you “understood” the hardness of stone. My refuge was poetry – particularly Wordsworth. I bought a copy at a second-hand shop. I hated all that poetry they served up at school – all that dah di dah di dah stuff. I wandered about a lot, looking at yellow iris and learning the smell of water and advancing snow. I wanted a poem to look out beyond to that place which could not be a place but which my tiny brain can only see in terms of a location. I must say that your own work “From This Far Time” touched me deeply by heading out on this path. That’s very sweet of you, Oscar! Your own response to that work gave me so much encouragement and hope for the future…you have no idea!! I’m curious as to how you actually work in your “poet’s cave”. As for subject matter, where does your poetry come from and who has influenced you? The poet’s cave is a philosophical place quite often of no thought or input. I have to go there just to be. The biggest fact of the human mind, the universe and everything that binds them together is something we completely ignore. Intuition is the dark matter of thought and the construction of our picture of existence within our consciousness is intuitive. This intuition is very much there in the child. The “system” both ignores and discourages it. Who says to a scruffy kid “I want you to wander about free, not trying to think anything. If you want to – or if you feel you just have to, come back and tell me what you felt”. Now that is not just a school for poets – that is a school for the world. The sad thing is that once we did have that power and freedom. We have forgotten where we left ourselves. You are one of the best spoken word artists I’ve ever had the pleasure to meet. You have a natural talent for dramatizing the written word and leaving us spellbound! Have you ever worked in theatre? No theatre I’m afraid. I think a critic would say that I just love the sound of my own voice. Look – we all have depth and nuances within ourselves. The voice can betray/reveal them. Life and poetry are acting jobs. Shyness and uncertainty make us reluctant to risk the true expression of our spirits. If I’m any good, it is because I have grown old enough to let go and just do what anyone could do if they stepped up and grabbed the microphone. Remove the editor’s hat and put on the poet’s. What message would you leave the world on your tombstone? What direction do you think your own poetry is going and where do you think poetry in general should go? Have you ever been part of the poetry establishment? I have lived through several re-launches, renaissances, second comings and new waves of poetry. None of them have changed the sales or perception of it. In a rather joking way I dub myself the “Poet Lorry-Park” in order to underline my allegiance to the cause of non-academic people. I feel that poetry was stolen, mystified and separated from the main stream of life by a clique of media connected cronies. They wanted the poetry world to be ten stars <strong “mso-bidi-font-weight:=”” normal”=””>and all the rest of us fawning upon their latest style of line break. To me, this is tosh. You can stuff a sonnet in your rhyming bonnet or ride into Jerusalem on your assonance for all I care. What I want is for anyone who feels a surge of joy, who poses an infinite question or who sees a dog peeing on a cabbage AND who really sees it and reflects on it to realise that they themselves are the poet. I do not believe in any regime or form of poetry. It is the naked honest mind seeking to use this heavy toolbox of words to do a job no one will ever complete. The subject and my intellectual/emotional relationship with it dictate the form of what I write. How can I be bigger than the power of the unwritten poem? The poem is the statue unborn, yet living in the stone. I have skirted around the poetry establishment because I thought I might pick up some electricity from the overhead wires. I felt the current but essentially they only wanted a coin for their trochaic meter. In short, let there be poetry and let all be poets. Those with the best words will be guides, not stars. Finally, Jo – my dear friend, thanks for inviting me to ramble on for far too long. I dreamed that one day I would be a poet. To be so dubbed by a poet I admire so much is a true honour and happiness. Thank you so much, Oscar! It has been my distinct pleasure to know and work with you!! Following on from his chat with Paul Tobin yesterday, we are pleased to welcome back Oscar Sparrow to interview Jo VonBargen, a poet from the USA…. Many lives are unfulfilled. This is a big statement and of course, I only know a few people. Yet, we know it do we not? So much tempting fruit is dry, so many talents lie unexpressed. I have been a life long reader of poetry and have come across many beautiful and thoughtful poems. But you know, there was never quite enough juice. There was never that stepping stone to the beyond that I wanted to imagine. I had not expected to see the sort of poetry that I had always wanted to read and could never write myself. Then, I came across Jo Von Bargen based on a recommendation from the American novelist Bert Carson. His tip led me to Jo’s long poem “From This Far Time“. This work has become one of my all time favourite books. The scope is huge and the imagery quite breathtaking. In a sweep she conveys slavery and apartheid with the “‘plowmule sky of dragging days”. The evolution of life from the prehistoric mud is “a glissando of slow subterraneans”. In this poem, she takes on the formation of life, its degradations at the hand of man and states a pure philosophic truth that “No law can transform/What the soul hasn’t learned”. I would make no secret of the fact that Jo was one of the inspirations for “Freeze Frame”. Like the other contributors she is distanced from the official establishment of poetry.Good job too – she would break it in half! She cares nothing for fashion or trends. Her subjects are the whole of life. Her physical voice and accent is a joy – just so full of notes and humanity. As a teaser here is a special treat. I’m so happy that you have been able to contribute to Freeze Frame. I have looked for a variety of subjects and approaches to poetry for this anthology. To me you are an absolute master of imagery. You have that ability to connect the reader to an idea with a sudden picture insight or juxtaposition. Is this a gift or something you have worked on? Thank you so much, Oscar! And sincerest gratitude for all your hard work on this project! You are a fantastic editor to work with. I am grateful for the gift, and I have consciously worked to develop whatever talent is there. I have always best learned from a word picture, so I was sure others would respond to it as well. It has served well in the overall body of my work, it turns out. Did you just wake up one day and realise you were a poet? Did you receive encouragement early on in your development? Poetry has always been natural to me. My Mother saved poems I wrote from the age of six onward. I think I really got the bug seriously in the early nineties when I first read all the Beat poets, Allen Ginsberg, Jack Kerouac (although he would argue that label for himself), Gary Snyder, Lawrence Ferlinghetti, and many, many others. Bukowski was a particular favorite as well. I had been reading Erica Jong and was enchanted by her poetic form. I’d never, ever read anything so truthful at its core. She was absolutely fearless, like Bukowski. So, 1990 onward was a particularly frenzied time for me in seeking to develop my voice and style. “From This Far Time” came out of that period. To me your style is entirely unique with its jazz, classical, objective, scientific, emotional, joyful and despairing tones among many others. Where does your poetry come from and who has influenced you? Hmm. See previous for influences. Thanks for that, Oscar. I’ve always had a deep curiosity about the sciences and all the arts, so I have studied these areas intensely. Knowing how things work is very important to me. I think it all mostly comes from my life-long ability to get to the truth of a matter. As a child, I got a spanking nearly every day for blurting out unwelcome truths at home. I never seemed to have the “veil” over my eyes like others did. Everything was crystal clear from the start. I could smell adult BS a mile away (except from boyfriends), and regularly voiced it….to my own detriment. I never fit into the form in which they were trying to mold me; I suppose I knew life was NOT what they said it was and I wasn’t going to be trained like a circus seal. Needless to say, I was considered the “black sheep” of the family, even to this day. How do you work? Is it always inspiration or can you grind out that difficult line with doodles and re-writes? When I’m out walking, sometimes a thought will strike me from the blue and it will tumble around in my mind for a couple of days before I finally have to get it out and follow the thread. I often don’t know what I really think about it until the poetry begins spilling out. It is this art form that has educated me, for sure, and led me down research paths that have vastly enriched my knowledge base. Sometimes it comes out perfectly formed, and sometimes I have to dink around with it until what I was searching for becomes crystal clear. Usually a subject to which I have great emotional attachment blasts out just as I intend it. Anger or sorrow are great creative motivators. In addition, I’m often inspired by other poets and the subjects on which they write. I seem to be attracted to arcane or unpopular topics in society as a whole and dig deeply into those as well. Secrets and mysteries beg to be unravelled! Do you remember your first poem and how did it come about? As I remember, it was about my little golden Cocker Spaniel puppy, when I was six years of age. Our neighbour found her dead of poisoning in her back yard and brought her home in an apple basket. It was my first experience with death and emotional loss. I could not find relief from deep mourning until I wrote about it. 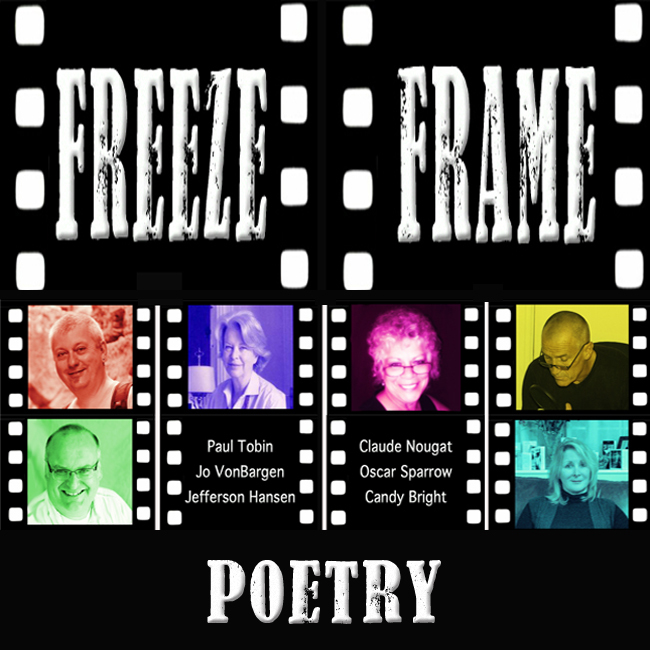 Freeze Frame features the physical voice of the poets. I love your accent and the feeling in your voice. Your featured poem “Pole Dancing” was recorded live. This poem always gives me a big smile and a WOW feeling. Are you an experienced live reader? Thank you, Oscar! In the nineties I lived and worked on campus at Southern Methodist University and was a featured poet at many a poetry reading (non-academe). The campus newspaper regularly published my work. In addition, a nearby bookstore, Shakespeare Books, had open mic every Friday night, and I read a lot there. I miss those days! Poetry lovers are a pretty scarce breed out here in East Texas. Where do you think your own poetry is going and where do you think poetry in general should go? Have you ever been part of the poetry establishment? I hope my poetry goes in a positive direction and that I can add sufficiently to my life lessons that my work will reflect thoughts that will enlighten others. Society is changing very fast, and I believe humanity will reach new heights of enlightenment and oneness with others. I have never been part of the poetry establishment, period. I’d rather stick a needle in my eye. One must fit into a certain mold and work a certain way within those halls, and it’s my opinion that true creativity is often squelched before it can fully develop. There is also a level of snobbery within it that is totally against my own nature. No thank you! It was fascinating to see Jo’s responses. In the foreword to Freeze Frame I describe her as pure poet rock with all its glinting impurities. You don’t have to wait for the anthology to check out her work. I can guarantee that some of her images in words will live on in your mind. She is a rare talent indeed. Thanks Oscar and Jo for fascinating insights into your lives and your poetry. This weekend we have drafted the jacket artwork for the new book and hope to do a ‘cover reveal’ by the end of this week. 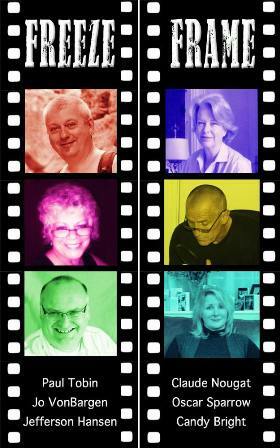 We have also been enjoying the music that was commissioned to feature on the audio version of the book…. more about that soon (maybe a sneak preview of the track on this blog! ).